Well, we’re finally back from our weeks of being road warriors! Did you miss us? =) We missed you! Thought I’d share a few iPhone pictures from our travels and update you as to where we were! So, we’re back from our travels. Where did we go, you ask? Well it started out with Holly’s brother’s wedding up in the Upper Peninsula of Michigan, way up near Canada. We drove, visiting friends and shooting portraits along the way up and back, logging about 20 hours driving and 2,344 miles in our trusty Eddie Bauer Ford Exploder (sic). Holly got onto me for taking pictures while driving. So I quit after this one. We were back for literally 3 days before leaving for a wedding in Greenville, SC. Being that close to the ocean, we just couldn’t resist visiting the beach. I’m an island boy, and still find myself irresistibly drawn to the ocean, beach, boats, etc., despite living a thousand miles from any good beaches. =) So, we hit Myrtle Beach, meeting all of my immediate family there for a few days at the Island Vista Resort and was it ever beautiful and relaxing! Ten days at home, and we were off again, this time to Florida for some portraits and relaxation with friends! Have you ever heard the quote, “A vacation is where you see what rain looks like on other places” ? Well, we were afraid that’ what was going to happen in Florida. The 10 day forecast was for Thunderstorms every day. Thankfully, the weather there is crazy and the storms blew by us most days. Here are a few iPhone pictures I took in Florida that relax me just to look at them again. Feet in the water, looking back to the beach-front houses. Cool clouds & white sand! 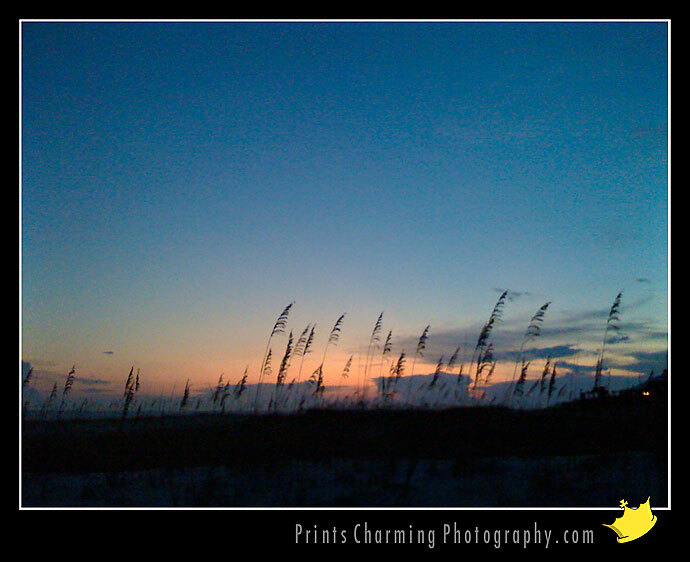 The “Sea Oats” were out, and they’re so pretty. It’s a short season, so we got lucky. Funny, I think it’s the flock of birds that really make this image. If you follow us on Facebook, you got a preview of this trip from iPhone pics we took along the way. By the way, not sure if I’ve mentioned it on the blog before, but if you have a Facebook account, we’d love it if you’d check out and join our Prints Charming Photography Facebook page here! It’s our 10th anniversary of being in business, and we’re considering how to use that Facebook page to share special deals to members. We’ll also use Twitter to spread the word about special deals, so you can keep connected there too if you like. I’m uploading more of these vacation pics to my personal Facebook page now, so if you want to see a few more, try this link to the album. The girls did really well on all the trips, actually. They sleep well in the car, so that helps a lot. My headphones help a lot at other times, if you know what I mean. Seriously, I think I listened to about 100 podcasts, and 4 or 5 complete audiobooks! Well, we’re off to a wedding reception, so I need to get everything ready and scoot… Thanks for checking in! We’d love to hear from you, so leave us a comment!